I am sure that many of you, like me, had some serious anxiety as you went to bed last night. After last April, I will never again react in the same way when I hear tornado warnings. I know all too well how unbelievably devastating they can be, and the thought of living through another nightmare like that is at times too much to process. My husband stayed up from 3 to 5 AM watching the Polygons this morning. They came within two streets of our house, and he was ready to wake us all and race us to the basement. Fortunately, that didn't have to happen, and I was able to sleep soundly, knowing that my husband was on the watch to protect our family. So many other families were not as fortunate, though. I watched the news today and saw the photos of Clay - some of them were so reminiscent of last April, and my heart broke for the individuals, families, and neighborhoods that were affected. My wheels began turning as to how I could help. Immediately I remembered a project that had been in the works for the last few weeks. A great company that I've worked with had contacted me a few months ago, wanting to know how they could help Alabama recover from last year's devastation. We talked about several ideas as to how they could partner with Alabama and bloggers in particular, and they asked input on what local charities they could donate to. I immediately suggested the Christian Service Mission, an organization that has been crucial in our state's recovery process. They agreed, and just recently set up this great page to pledge their donations to the CS Mission. They have pledged to donate $25 to the Christian Service Mission for every blog post that is written about how last April's tornadoes (or today's tornadoes) affected you. All you have to do is write the post, then comment on their page and let them know about your post. Their goal is to donate $1,000 by March 1! I am excited about helping our state. Won't you join me? Please help me spread the word to other bloggers statewide so that we can all help raise money for our state, while at the same time raising awareness for the needs that are still so urgent. I am so thrilled to be a part of this, and I hope you will join me! 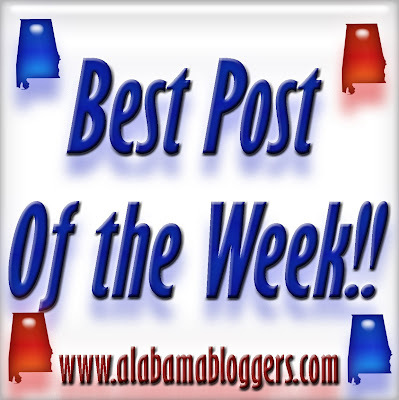 Our next Alabama Blogger's meet-up will be on Friday, February 3. We will meet at 11:30 in the back room at Jim N Nick's in Homewood (Oxmoor Road). We're always around for a while, so if you can't get there on time, get there when you can! If you would like to join us, RSVP on this post. Be sure to help us spread the word - the hashtag is #AlaBlogMeet.